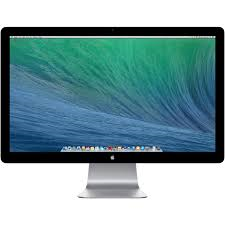 The most popular Apple Cinema display in the range, with its impressive 2560x1440px resolution, this screen is a great hire option for a Mac Mini or as an external display screen from a MacBook or a Mac Pro. The LED Cinema Display is the perfect companion for your MacBook because it includes a convenient universal MagSafe connector that powers and charges your Mac. It boasts a big display for your content, and has an iSight camera, microphone, 2.1 speaker system, and USB hub; this cinema display has a tonne of built-in conveniences that will make your life easier. Have video conferences with your MacBook closed, listen to music without headphones and leave your USB peripherals connected to the display for quick get-up-and-go productivity. You can hire an Apple Cinema Display now for your next event – want to learn more? Contact ITR now.